Select your membership plan and get our best training and personal defense videos with 24/7 access to tips and drills from our PDN instructors, automatic renewal and our ‘cancel anytime’ policy. 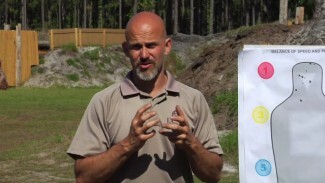 Rob Pincus conducts ballistic gelatin testing on the new Hybrid-X ammunition from Winchester. He fires a round of 9mm Winchester Hybrid-X into 10% ballistic gelatin through two layers of cotton fabric, to obtain wound ballistics data. What sets the Hybrid-X ammunition apart from other rounds? Hybrid-X is a new design from Winchester Ammunition, and it may revolutionize personal-defense ammo, or it may just give you another great option to load into your defensive handgun. Ammunition is a necessary part of our self-defense gear. With Hybrid-X ammo, the round penetrates into the core before the fragmentation starts. A traditional bonded hollow-point round also opens up only after it has penetrated the body, but the Winchester Hybrid-X gets deeper into the body before it begins to spread out the damage. Vital organs are deep in the body, not near the surface. Wound ballistics show that a round that fragments as soon as it hits a target does much less damage than one that fragments only after penetrating deep into the target. Hybrid-X is designed to give multiple fragmentation paths but still penetrate the 12 to 15 inches that we look for in a defensive round. Examining the gelatin block, the round fired does not fragment in the first four to five inches. The only actions are the twisting and cutting as the bullet rotates through the block. At about the five-inch mark, expansion begins when the front of the bullet breaks apart. This continues for about 1.5 inches, then the true fragmentation occurs as the front of the bullet breaks off. The fragments penetrate 13 to 14 inches, with the penetrator core going up to seven to eight inches. Looking at the gelatin block from above, we can see that because of the multiple fragments coming off of the main core, we have a much wider damaging path than we would have from a single projectile. Previous rounds of this type have resulted in shallow penetration, in other words, not reaching the body’s vital organs, where they can do serious damage to the bad guy. Rob’s testing confirms that the Winchester Hybrid-X performs as advertised. This new ammo looks to be a good choice for concealed carry and personal defense. 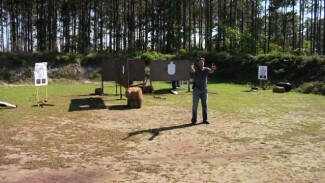 Brain Sabol discusses the importance of defensive firearms training for a 360 degree world, even on a typical square range. Brian offers some ideas for how you can train more realistically even when your live-fire options don’t include 360 degrees. 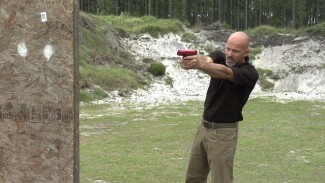 There is a long-standing misconception in the gun industry that you gain an advantage by using a pistol with your weak hand when you are firing from behind cover.